For obvious reasons, this is the best e-mail I have ever received. The names have been changed to protect the guilty. 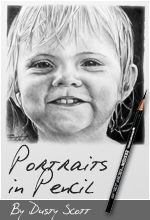 Hey, my name is Mike; I just got introduced to your site and am entertained by your writing style and outlook on life. By entertained I mean no sarcasm, I find your everyday trials and adventures to be a window into someone else’s life that’s more entertaining than my own (or at least perceived as such). But today I write to you with a humorous tale that in fact you are at the base of. Me- Hello, this is Mike. Ron- Hey Mike this is Ron. Me- Hey Ron, what’s up? Ron- Well, I had a question for you. What’s your Grandpa’s name again? You know the one that does all that Mark Twain stuff? Ron- Oooohhh My Gosh, are you joking? Bu Wa Ha Ha Ha Ha! Ron- (After regaining composure) Okay, there’s this guy who has this site. 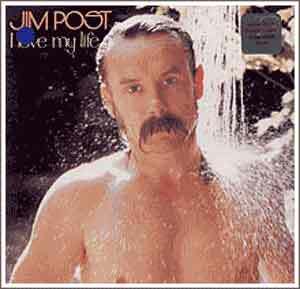 . .
Well, if it hasn’t already slapped you, Jim Post has the #1 worst album cover of the 2nd “Bottom 10” list “More album covers. Last one, I swear.”and I’m his grandson. . . The reason I’m writing today is not out of spite or to disagree with you awarding my Grandfather such a prestigious title. No, I write to regale you with a story of how I went about telling my Grandfather Jim that he had been given a major award and what the ‘Presenter’ had to say about him. Before this last Thanksgiving I had obtained a copy of your review on said album of Jim’s, and thought it appropriate to share this with all extended family members that were to be at Thanksgiving this year. So I went to My Grandparents house (where the festivities were to be held this year) with an extra twinkle in my eye. I waited until I felt the moment was right, when everyone would be the most attentive and really be able to appreciate the news I was to bring. Just as we had lifted our heads and opened our eyes from the opening prayer, I thought, “Well, now is as good a time as any.” With a smirk in my voice I started by telling everyone of the phone conversation with Ron which lead to the web-site and that directed us to your commentary/review of the said album cover. After I had finished my telling of this saga, I lingered in a canopy of uncertainty. How would he take this? What would the family say? Would I survive? In a moment that seemed like forever, but was in fact only a breath, my answer came as a gushing froth of emotional reaction. The table before me erupted in a surge of entertained glee. And at the head of this table dripping with tears of amusement was my Grandfather, Jim Post, mustache soaked with the same tears of laughter that had taken the rest of the Thanksgiving party. After Jim had rung out his hairy lip covering and shook his Einstienesque locks of gray, he went on to recount other persons in his past who have commented on this same album cover. He went on to say that this is not the first time he has heard of someone “Awarding” him the worst album cover ever. Now I started chortling all over again. The story behind the picture is simple: The photographer had him in an outdoor shower and as he “showered” many pictures were taken. On a round about pass the photographer caught Mr. Post in an unusual pose. And so the photo went from camera guy strait to production, and at the time Jim didn’t care he just wanted to make music. So there you have it, a funny story of how your musings made its way into my family’s Thanksgiving. Oh! And what did my Grandfather think of what you had to say? Well, I’ll let the picture taken by my camera phone say the thousand words. 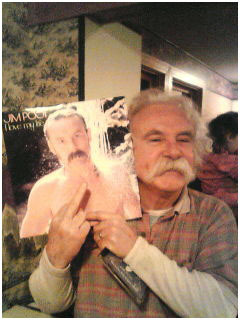 He really did think it was funny, but after he had pulled out all his old record covers I thought I should get a picture to send you. Since I have spent entirely too much time on this E-mail I will let you go. If you could drop a message to me as to what you thought (seriously) or at least a rendering there of, that would be cool. Or my message was entirely too long and by reading it you’ve grown so weary that you have now fallen asleep on your keyboard and have typed the letter ‘G’ 1,284 times. But hey, don’t come crying to me when you’re laughed at for having the upper row of keys impressed onto your forehead. Well Mike, I can’t thank you enough for taking the time to write to me. That is the number one rockinest picture I have ever gotten (and I’ve gotten some rockin’ pictures). You also saved me the trouble of having to write something myself today.